Sara G, Big Blue and Hallin Marine: Who will win? 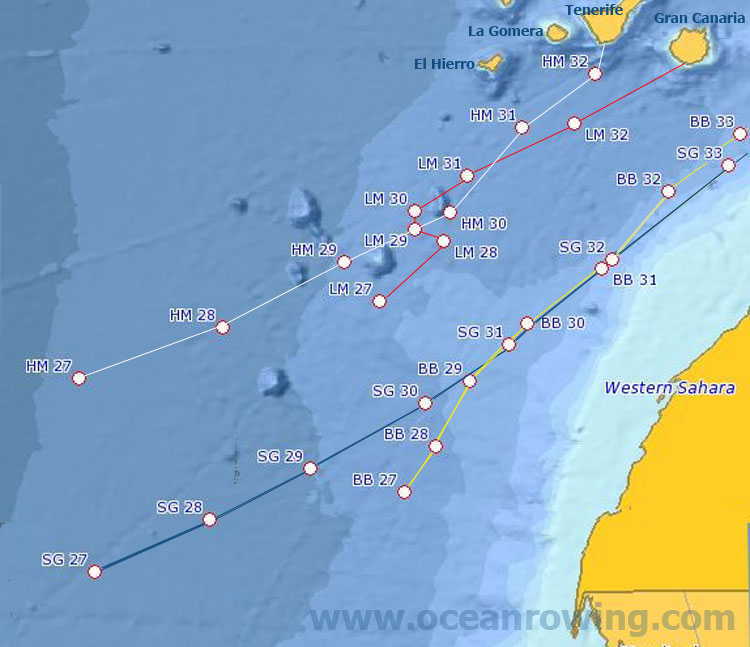 Trans-Ocean rowboat Sara G is on her way back to Barbados for her second visit and this time she’s wanting to break the world record for the crossing. Only trouble is that two other teams have the same idea. As I write this Sara G is the lead boat but just a cat hair in front of Hallin Marine. Sara G is a traditional single hull boat while Hallin Marine is a trimaran. Big Blue (above) is a strange looking vessel that is the world’s first catamaran competition rowing boat. BB has a huge crew of 16, but they look like they are falling behind the other two boats. All of them are still ahead of the 2007 track of the record-holder La Mondiale. La Mondiale’s record stands at 33 days 7 hours 30 minutes to Barbados and that’s what the current three boats are trying to beat.